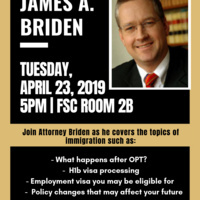 Immigration Attorney Presentation - Working in the U.S.
Join Attorney James A. Briden as he speaks on immigration and employment options after OPT. This presentation will also cover information about policy changes including on-going and potential changes in H1B sponsorships. Questions? Contact Kaoru Paganelli at kpaganel@bryant.edu. Sponsored by the Office of International Affairs.